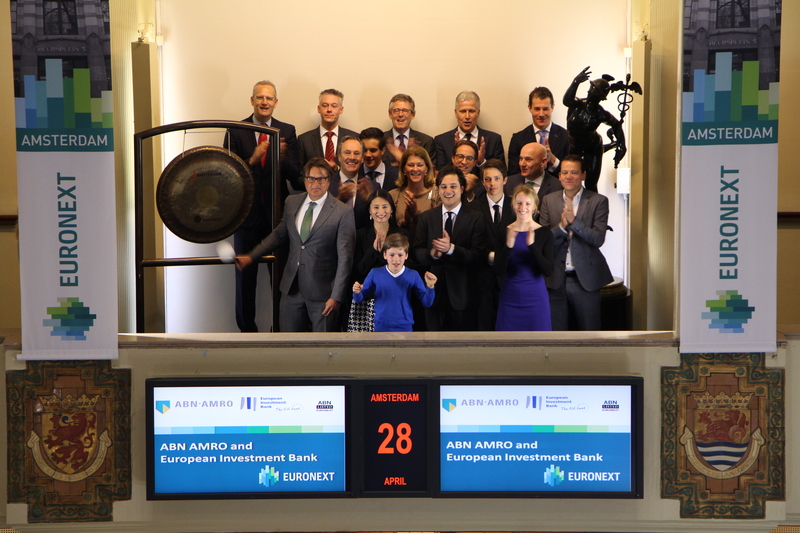 The European Investment Bank (EIB) and ABN AMRO (ticker symbol: ABN) have signed an agreement to support investment in green European shipping. It is the first agreement on investment in green shipping with a financial institution in the Netherlands. 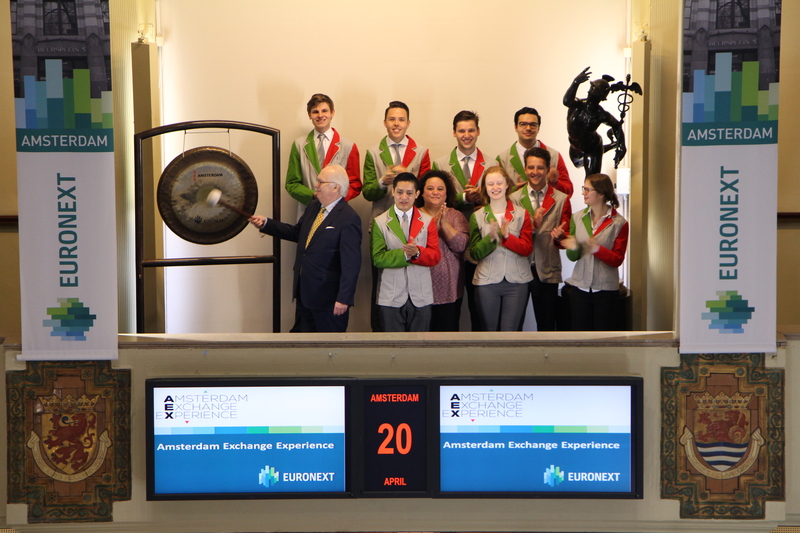 On this occasion they visit the Amsterdam exchange and open trading by sounding the gong. The agreement ensures that promoters of green projects, in the maritime transport sector, can benefit from favorable financial conditions through the EIB's AAA-rating. These conditions apply to both retrofitting of existing shipping and the construction of new vessels with a green innovation aspect, and for both inland waterways and sea shipping. The EIB Facility is an additional incentive for ABN AMRO to encourage shipping customers to seek sustainable solutions and fits perfectly with the bank's other efforts to promote sustainable solutions in this important sector. On King’s Day many ‘Oranjeverenigingen’ are busy organizing a village or town festival. The KBOV is the national representative of all ‘Oranjeverenigingen’. They visit Beursplein 5 and sound the gong. The KBOV helps ‘Oranjeverenigingen’ with advice and information and organizes meeting points for exchange of experiences and ideas. In addition, the KBOV want to make clear that this kingdom, which is not bound by party or group, represents the plural society for every Dutch citizen, regardless of origin, race or religion. The KBOV stresses the importance of promoting and strengthening the bond between the Dutch population and the House of Orange. It seeks to achieve this by initiating and stimulating celebrations and other commemorations to mark heyday in the House of Orange. By now, more than 320 local ‘Oranjeverenigingen’ are a member of the KBOV. DSI Foundation, the self-regulation institute for the financial sector, celebrates 10 years of DSI Screening by sounding the gong. DSI organizes certification, screening and discipline in the financial sector, and provides a public register in which consumers and businesses can check which financial professionals are DSI certified and thus meet high quality standards in terms of integrity, knowledge and professional competence. Since 2007, DSI is the court supplier of personnel screening for the financial sector. In cooperation with the financial sector, DSI developed the standard for staff screening. The method on which DSI performs the screening is supported by the AFM. Since 2007, non-profit DSI has performed over 40,000 professional screenings at cost price, for both professionals who applied for a job in the financial sector and for various service providers to the sector, such as accountants. The purpose of DSI is to strengthen trust in the financial sector by providing transparency, high-quality permanent education and professional screening that cares for individuals and companies from A to Z.
Sponsors of the Inside ETFs Amsterdam event, Dimensional and Think ETF’s, visit the Amsterdam exchange to open trading by sounding the gong. The Inside ETFs Amsterdam event takes place at the EYE Filmmuseum, 25 April. 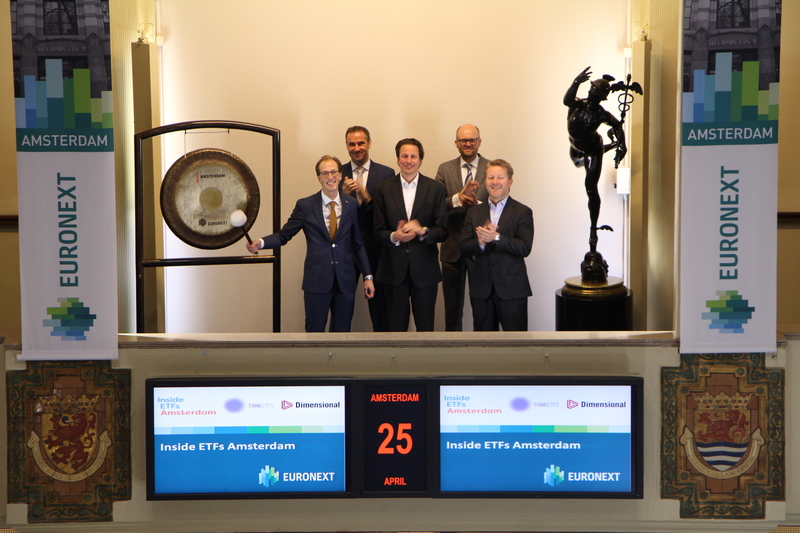 The program of Inside ETFs Amsterdam is changing the way the Dutch manage assets by providing bright ideas, cutting-edge research and new solutions for today’s evolving markets. Designed for fund selectors, financial advisers, family offices and other investors, the program will leave attendees with actionable ideas and insights they can put to work immediately in any portfolio. 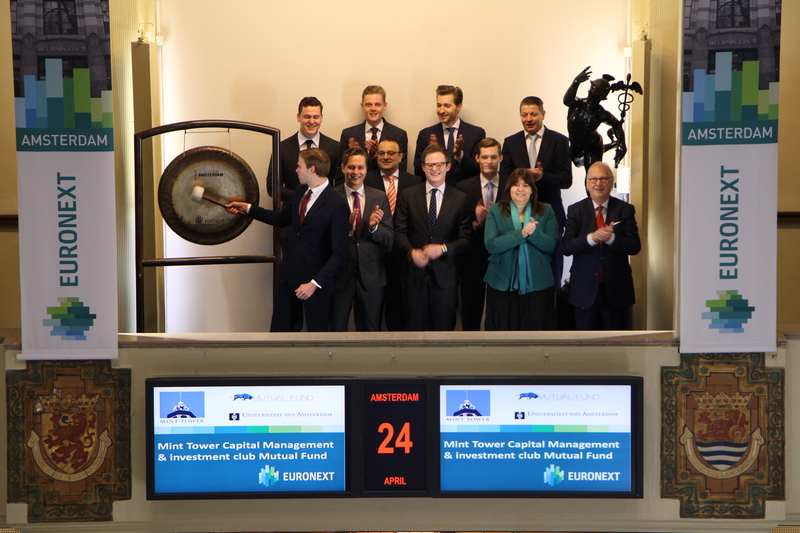 Mint Tower Capital Management opens trading together with Mutual Fund on the Amsterdam exchange to celebrate the 7th anniversary of Mutual Fund. Mutual Fund strives to be a linking pin between highly motivated university students and the Financial Markets. By contacting organizations in the financial world, Mutual Fund strives to build durable relations with firms like Mint Capital Management, located on Beursplein 5, Amsterdam. Mutual Fund is a student organization for highly motivated students with interest in Financial Markets. The main goal of Mutual Fund is to facilitate an educational platform for students with interests in buying and selling financial instruments. The common focus of the students contributes to a highly motivational environment where knowledge and new insights are developed. 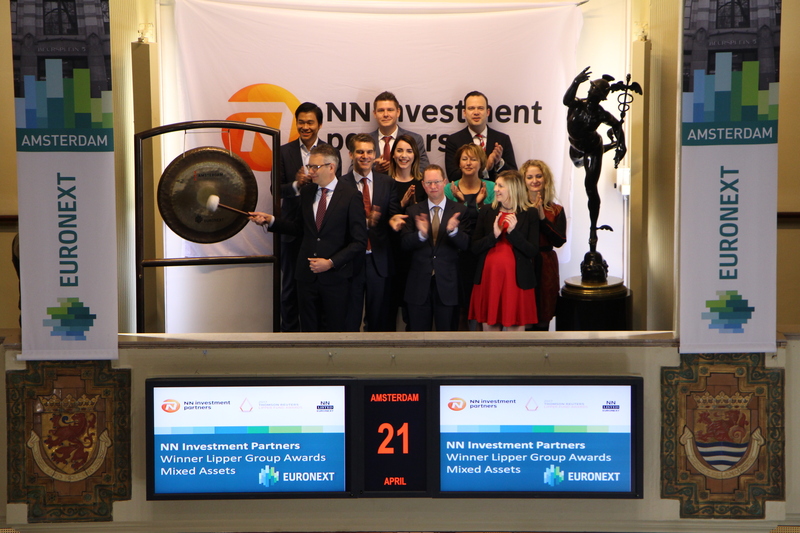 NN IP visits the Amsterdam exchange after being awarded by research entity Lipper for two defensive Multi-Asset funds from NN IP’s fund offering. Ewout van Schaick, Head of Multi-Asset Portfolio’s at NN IP, sounds the gong and opens trading. In the category ‘best defensive Multi-Asset fund’, Lipper granted, for the fourth year in a row, the NN Dynamic Mix Fund II an award. Moreover, the portfolio management team and the investment process itself were granted the award for “Mixed assets large company” (just as in 2015 and 2016). Furthermore, NN IP got to take home the price for best overall large company 2017. This year ,Lipper chose a defensive Multi-Asset funds as a winner and awarded the NN Dynamic Mix I fund. Ewout van Schaick, Head of Multi-Asset Portfolios at NN IP: “In addition to an extensive and highly experienced investment team, the success of the mix funds is explained by combining thorough macroeconomic analysis, valuations and other fundamental factors with the study of investor behavior. We think that factors such as momentum, investment flows and investor sentiment play an increasingly important role in explaining markets. This approach worked well last year. We saw that economic data improved slowly during the year while rising political uncertainty led to the fact that many investors remained very carefully positioned. We kept our preference in our mix funds for riskier investments while, in part, we hedged ourselves against the unexpected results of the Brexit referendum and the US election with specific positions in, for example, currencies like the British Pound or Mexican Peso. We consider winning these awards as a confirmation for consistent team performance." The Amsterdam exchange celebrates the 1250th tour of the Amsterdam Exchange (AEX) Experience; an interactive exhibition about the importance and role of the exchange for the economy, the listed companies, the history and the traded products. Coordinator of the Experience, Ton Ruitenburg, sounds the gong together with members of the Experience team. During a visit to the Experience visitors learn about the exchange and its social role as a growth engine of the economy. The exhibition also shows its rich history, which goes back to the East India Company (VOC) and the activities of the listed companies. Visitors get the opportunity to determine their investor profile and can test their skills as a trader in the crowd. Visiting the trading floor is also a part of the tour. 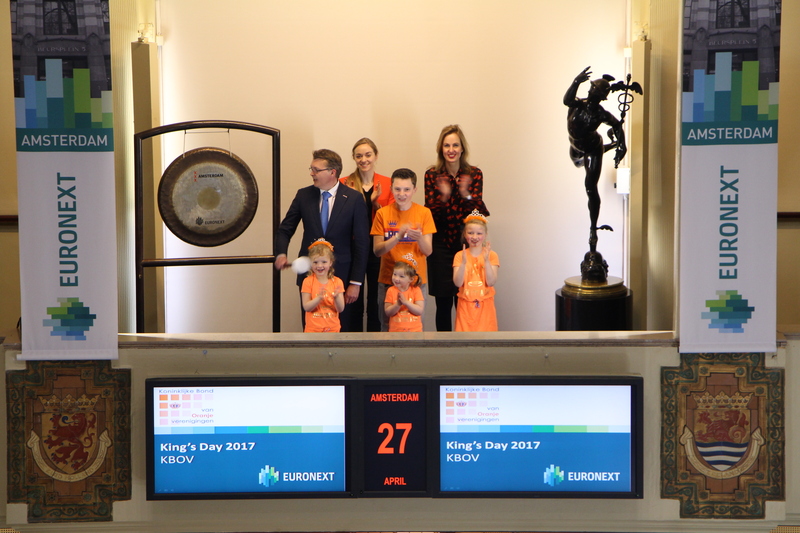 The Experience was opened in November 2013 by Her Majesty Queen Máxima during the celebration of the 100th anniversary of the Amsterdam Stock Exchange at Beursplein 5. 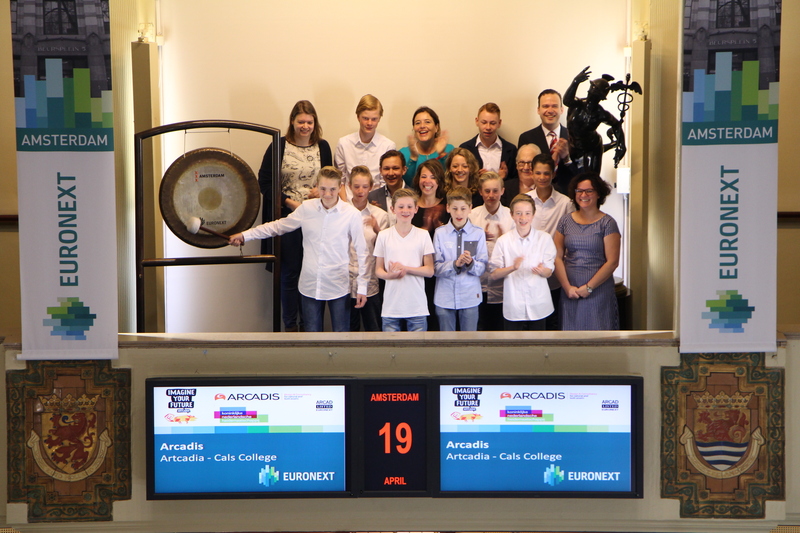 Cals College from Nieuwegein recently won the Artcadia Art and Technology finals. The winning design is the Multi Mill, a design that combines a windmill at sea with solar and wave energy plus tidal power. The winners visit the Amsterdam exchange and open trading. The contest was organized by design and consultancy firm Arcadis (ticker symbol: ARCAD), the KNHM foundation and supplier of digital printing systems Canon Business Services with the objective of having secondary education pupils experience the fascinating world of technology. The Cals College won first prize with the idea for the Multi Mill: a trip for ten pupils and two teachers to visit exceptional places and technically interesting projects in Paris where they will be taking a look behind the scenes. Secondary education pupils in the Netherlands were challenged to produce a project with which to present their take on our future society. Issues in the field of buildings, water, the environment & public space and mobility were tackled with creative technical solutions. Technology and art contest Artcadia, for pupils in group 2 of the higher intermediary educational programs, was held for the eighth time. A record number of 117 schools entered the contest this year. Kempen & Co is proud to host the annual Kempen Life Sciences conference for the tenth time. On this occasion they visit the Amsterdam exchange to open trading. This conference has become a central meeting place for global institutional investors and European Life Sciences companies, with its signature format focused on one-on-one meetings and small group meetings, as well as a networking lunch and showcase session. Like previous years, the conference will be attended by executives from a wide range of companies from continental Europe including pharma, biotech, diagnostics and medtech. As one of the few focused merchant banks in Europe, Kempen & Co is uniquely positioned as a specialist in the Life Sciences and Healthcare markets. 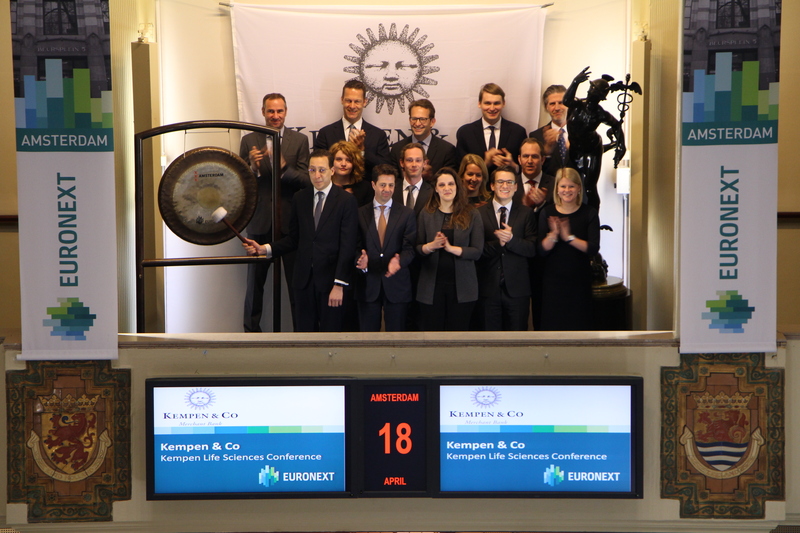 Over the past years, Kempen & Co have built a strong position in this sector in securities brokerage, mergers and acquisitions, and equity capital market transactions. 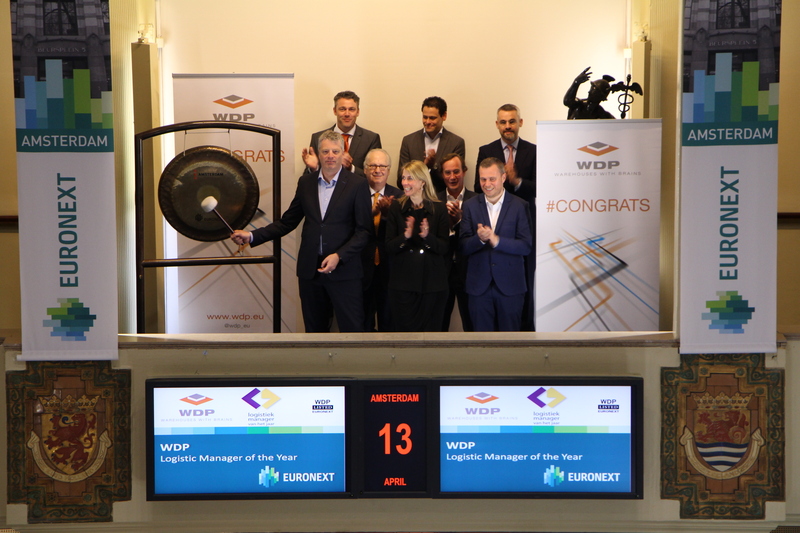 Logistics real estate specialist WDP (ticker symbol: WDP), since 2015 with a second listing on Euronext Amsterdam, invites Marc van het Bolscher (Tanatex) to sound the gong. From the 2016 edition WDP sponsors the ‘LMvhJ’ event which aims to get more attention for the profession of the logistics sector and the people work here. At the end it is the people who make the difference. The board of the ‘LMvhJ’ is also invited to take part in the ceremony. WDP develops and invests in logistics property (warehouses and offices). WDP's property portfolio amounts to more than 3 million m². This international portfolio of semi-industrial and logistics buildings is spread over more than 170 sites at prime logistics locations for storage and distribution in Belgium, France, the Netherlands, Luxembourg and Romania. 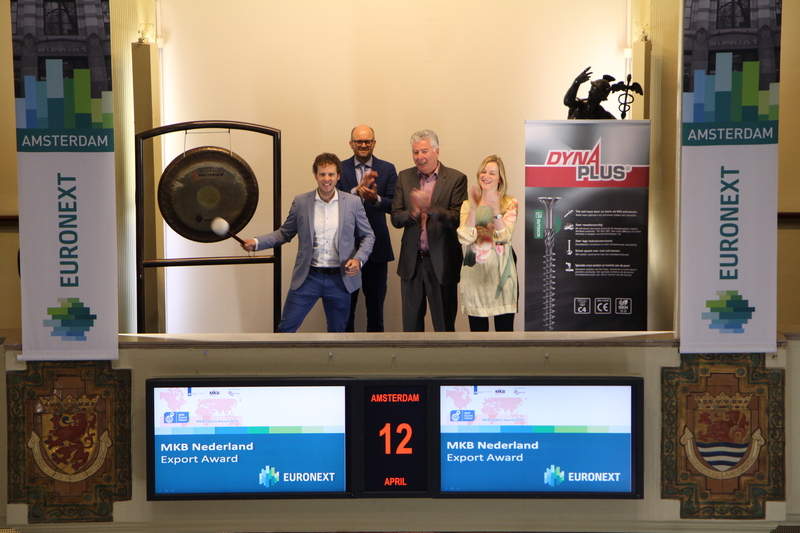 Bart Veldhuizen from Hoenderdaal Fasteners, winner of the SME Export Award, opens trading at the Amsterdam exchange. He opens trading accompanied by Annet Koster of MKB-Nederland, initiator of this export award for SMEs. New markets, innovative products and efficient logistics. These are the ambitions of Hoenderdaal Fasteners from Veenendaal, manufacturer of fasteners. The company has won the SME Export Award because of the sophisticated export plan that focuses on Sweden as a prelude to further expansion in Scandinavia. The SME Export Award has been awarded for the fourth year in a row. The award is an initiative of SME Netherlands in collaboration with the National Enterprising Netherlands (RVO.nl) and Language Institute Regina Coeli, designed to encourage SME entrepreneurs to cross the border or to expand their existing international activities. 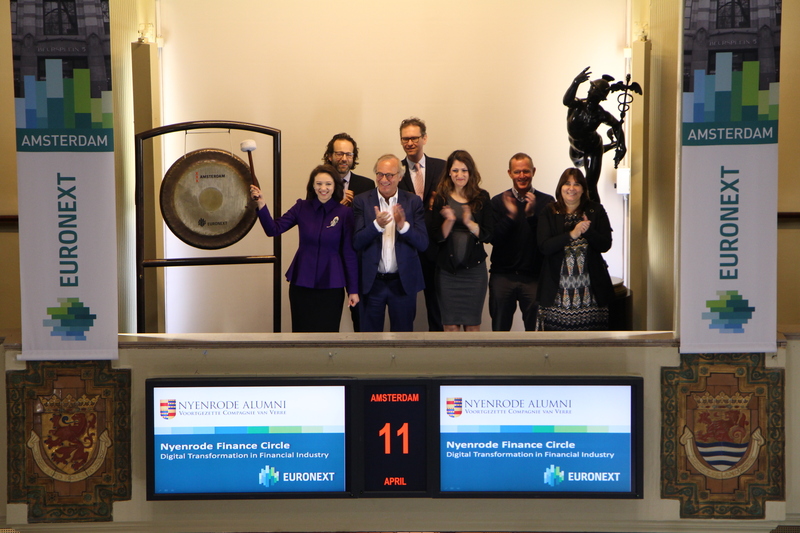 Nyenrode Finance Circle recently published a report ‘Digital Transformation in Financial Industry’, on this occasion they visit the Amsterdam exchange of Euronext and open trading. The contributors to the report are: Prof.dr. Dennis Vink (Nyenrode), Prof.dr. Steven van Belleghem (Vlerick) and Dutch financial institutions APG, PGGM, Optiver, Flow Traders, ING, ABN AMRO, KNAB en PWC. Digital technologies will have an immense impact on our society and financial institutions are required to lead their organisation throughout a period of transformation. Source Group N.V. and their sector colleague HeadFirst have merged to form the HeadFirst Source Group N.V. (ticker symbol: HFS), making it market leader in the field of hiring external professionals, matchmaking, contracting and pay roll work. 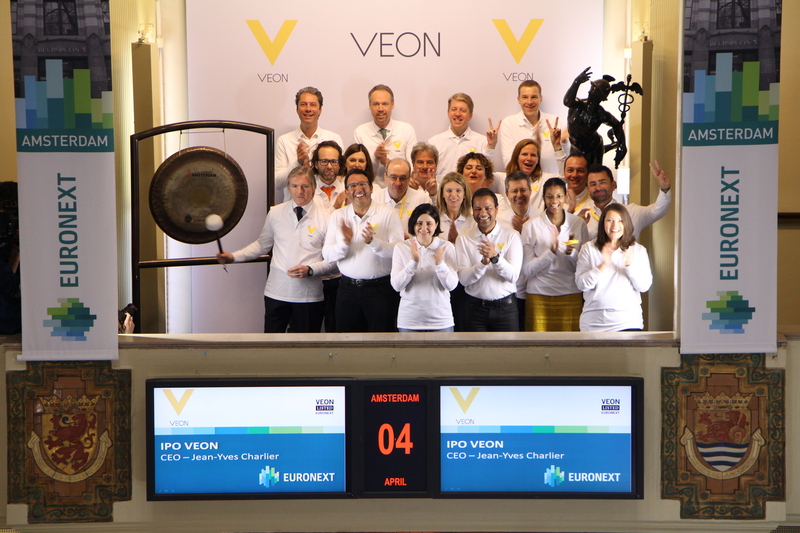 The trading symbol of the stock at Euronext changed from SOURC to HFS on 3 April. The new combination has also launched their new website. 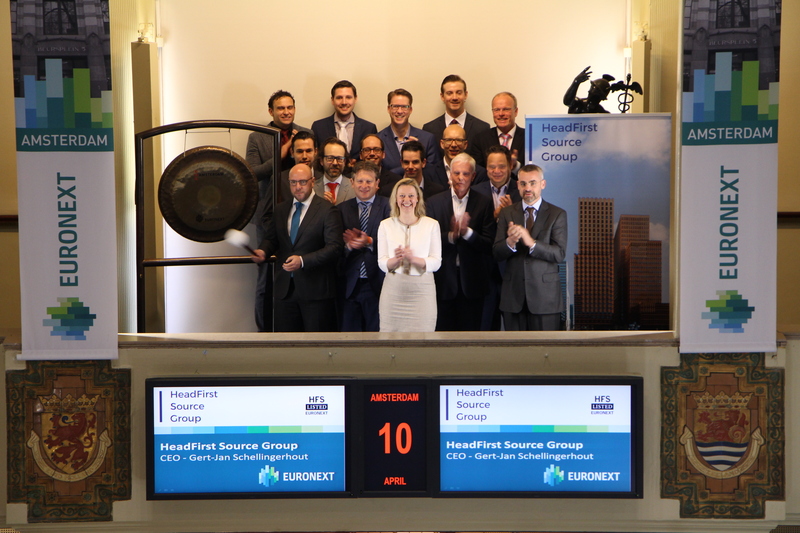 To celebrate these activities Gert-Jan Schellingerhout, HeadFirst Source Group's CEO, sounds the gong to open trading at Euronext Amsterdam. HeadFirst Source Group is market leader in the field of hiring of external professionals, matchmaking, contracting and pay roll work. Daily, more than 4,000 professionals work for in excess of one hundred clients in the Netherlands, Belgium and Luxemburg, realising an annual turnover of approximately 450 million euros. HeadFirst, Source and Proud Company are all part of the HeadFirst Source Group. The Morningstar Awards are designed to help investors around the world identify the year's most exceptional funds and fund managers. The 2017 Morningstar Awards recognize retail funds and fund groups that have been good stewards of investor capital within the context of their relevant peer group in 2016 and over longer time periods. 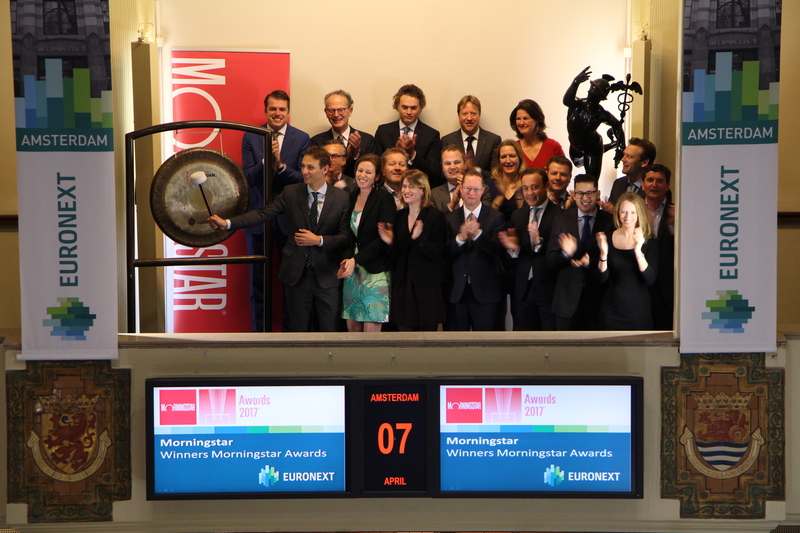 This year’s winners sounds the gong and open trading at the Amsterdam exchange. Winners are selected using a quantitative methodology developed by Morningstar that considers the one-, three- and five-year performance history of all eligible funds. Morningstar adjusts the returns for risk using a utility theory based screen that imposes a higher penalty for downside variation in a fund’s return than it does for upside volatility. Delta Lloyd Asset Management will be drawing special attention to the sustainable Delta Lloyd ESG Fund through a national multimedia campaign in the weeks ahead. Jacco Maters, CEO Delta Lloyd Asset Management, sounds the gong. Jacco Maters: “Sustainability shouldn’t be the exception, but the norm. 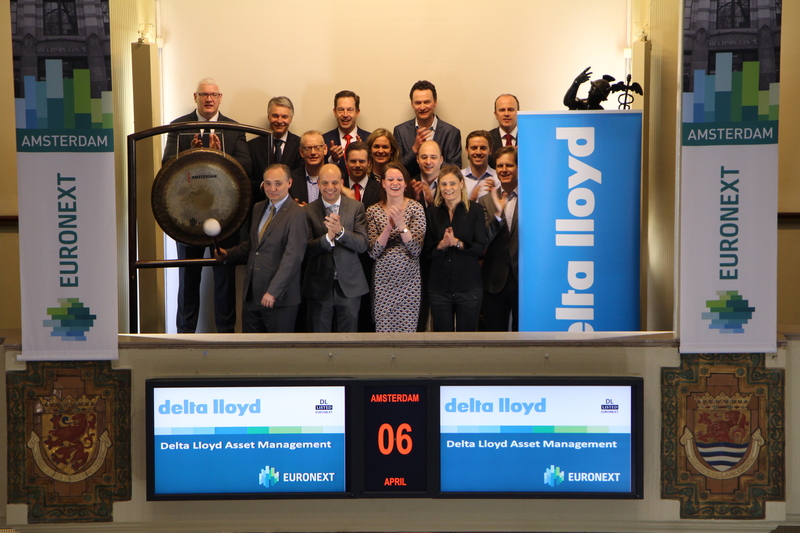 Our sustainability philosophy drives us to achieve important financial targets while still contributing to a sustainable world by standing up for people and the environment.” Today Delta Lloyd is putting extra force behind these words by sounding the gong to open the Amsterdam stock exchange. AF Advisors are already calling the fund the best globally-investing sustainable equity fund, and it has received the top rating of five stars from independent analysts Morningstar. The goal of the Delta Lloyd ESG Fund is to maintain low costs while following the value development of the MSCI World Index. The fund adheres to strict sustainability criteria as well as a ‘best-in-class’ investing method which focusses on identifying companies that demonstrate clear sustainability ambition, and supporting them in achieving their goals. X-FAB specializes in the design and manufacturing of analog and mixed-signal integrated circuits for the semiconductor and electronics industries. The group develops micro-electro-mechanical systems (MEMS) and silicon carbide circuits designed primarily for automotive, industrial and medical applications. At the end of 2016, X-FAB operated 6 production sites in Germany (3), France, Malaysia and the United States. 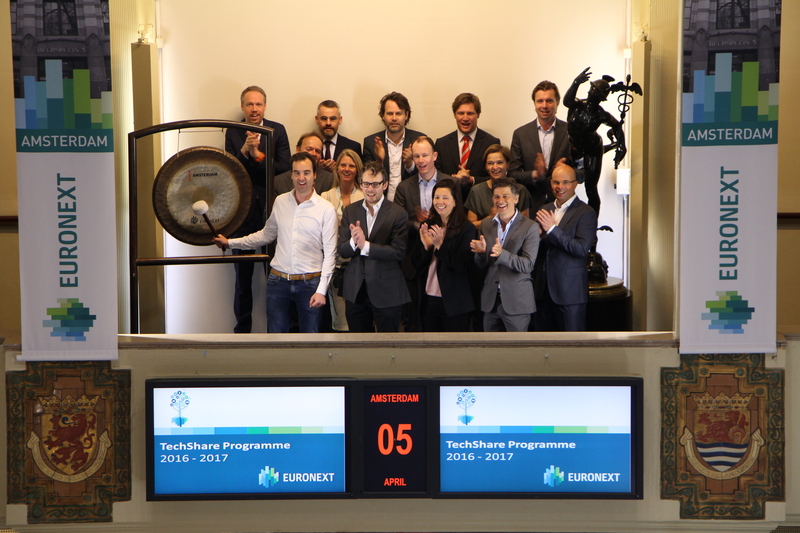 To conclude the second successful EnterNext TechShare program 2016 – 2017 the Dutch participants and partners sound the gong. TechShare is an educational program designed specifically for fast growing tech companies who want to know more about the process of an IPO. The participants have had educational sessions on the capital market in recent months. TechShare is a unique pan-European program that helps directors of tech companies to better understand the role and functioning of financial markets. Entrepreneurs are thus better able to assess the chances of a listing in relation to their specific projects and to take time to prepare. The program began in September 2015 in France with a kick-off where 30 companies were present from France, Belgium, Portugal and the Netherlands. The customized trainings are organized and supported by regional expert partners. Dutch partners of the TechShare program are Deloitte, Citigate FF, ABN AMRO and Rutgers & Posch. In four sessions they discussed all relevant issues of the capital market. The open discussions and case studies have resulted in a very useful and professional program for entrepreneurs. 3D Hub, Backbase, BENCOM, Dynamic Credit, Evision- Software, Lebara, Luxexcel, Microes, RES, Treeway and Voiceworks are the participating Dutch companies in the TechShare program. ‘’TechShare has given me the opportunity to expand my knowledge and capabilities of the financial markets more. I found the content of the program and the guidance from the partners very valuable. It is an accessibly way to, when the time is right, make a well-informed choice on the possible funding of Treeway.’’ said Inez de Greef, CEO Treeway. Due to the success of this second edition, the third edition of TechShare starts this fall, with hopefully equally interesting participants as last year. Patrick Jeantet CEO of SNCF Réseau celebrates the success of the agencies second Green Bond issue. Following its inaugural Green Bond issue for € 900 million at 15 year in 2016, SNCF Réseau has raised onto the market in March one more billion € through a very successful Green transaction with a 17 year tenor. Both to celebrate it than to highlight how sustainable development is part of SNCF Réseau values, Mr. Patrick Jeantet, CEO of SNCF Reseau, will make a brief allocution, before symbolically ring the market opening bell. .
Headquartered in Amsterdam, VEON is the name of the parent company and its new personal internet platform that integrates powerful data analytics and artificial intelligence, with a fresh take on messaging capabilities, enabling users and communities to connect by voice, text, picture and video through a beautifully designed interface. On 5 and 6 April KPN Zakelijke Markt (KPN Business Segment) is organizing The Dutch Digital for the second consecutive time. The Dutch Digital is an interactive event for corporate customers and business partners of KPN (ticker symbol: KPN). 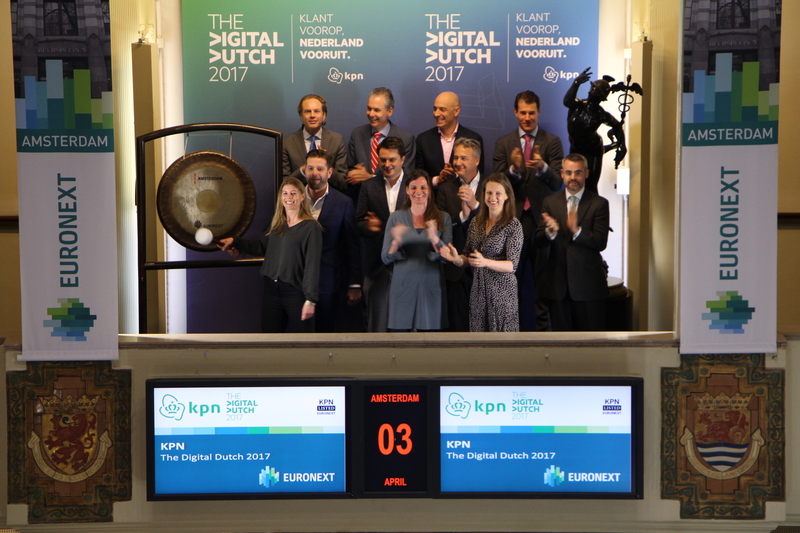 KPN visits the Amsterdam exchange and opens trading to bring The Digital Dutch to the attention. The first edition of the event was so well received last year that KPN decided to bring back customers into the world of digital transformation. In 2016, 75% of corporate customers in the event stated that they do exploit digital opportunities enough. With The Digital Dutch, KPN wants to show companies - from SMEs to large corporates - how ICT solutions can be specifically applied to better serve their customers.